Okay, this is one of those books you wish did not need to exist. Sadly, it does exist, it does need to exist. Happily, it is funny, in a "I'm not crying, you're crying!" sort of way. 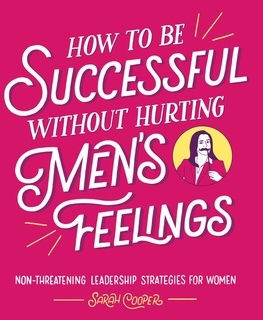 The book is satire on women and their role in the workplace. It touches on many of the stereotypes of men and women in the workplace, and their interactions, and human nature, and the absurdity of all of our biases. The mocking tone of the book could be off-putting, but it's funny for the most part, except for the parts where the humor is TOO REAL, and you cry instead. It's a fun read, if you're in the right mindset. If you're a guy, yeaaaaaaaaah, this is really how things are for the rest of us. When describing your accomplishments, you need to strike a balance between tooting your own horn and hiding your horn behind the shed. This is difficult because if you don’t take enough credit you won’t seem qualified, but if you take too much credit you’ll seem arrogant. Good luck with that. However, sometimes when women say the exact same thing a man says it’s interpreted in a completely different way. It’s enough to make you want to cry (which as a man means you’re sensitive and as a woman means you’re hysterical). Tone policing is an insidious way for people to disregard what you are saying by adjusting the focus to how you’re saying it. Authenticity is less about being the real you and more about finding someone successful to look up to and being that person instead.